​ Is a 501 C3 non profit organization that gives free boat cruises and fishing trips to handicapped, needy, homeless and at risk children with their family and friends. Including foster kids; and those who are seriously ill, have special needs, or have lost one or both parents due to death, divorce, neglect, abandonment or military service. To see what we do, please take a moment to look at this website & view the short videos that feature many of the kids we’ve had aboard. This non profit organization was founded by Master Captain Dave Tripiciano in 2013, using his first large "fixer upper" sailboat which was also rigged as a fishing boat. Since then we've grown, and we now have four beautiful boats in four great locations! One is docked in Youngstown, NY - giving kids and their families cruises up the lower Niagara River to "The Silo" restaurant for dinner and ice cream. A second is docked in Rochester NY - at the brand new, state of the art, Port Of Rochester Marina - Where we give fishing trips and lake, bay and Genesee River cruises; and a third is based near Geneva, NY at the north end of Seneca Lake for fishing trips, dinner cruises and sailing trips. Please note that if you live in a different part of the country and money is "tight", Captain Dave will pay part or all of your travel expenses to get to a cruise location; and he may even help you cover lodging and some meals for your family if needed while here. Please call us for details and more information. We have recently become a supporter of the “Make - A - Wish” foundation; and we've helped make some wishes (like taking the wheel of a “yacht” and catching a really big fish) come true! We also work with ARC, The Mary Cariola Children's Center, several group homes and Casey House in Niagara County to brighten the lives of "special" kids and their families every summer. Do you know a disabled child? One who is terminally ill, has special needs, or has recently lost one or both parents due to a death, divorce or neglect? Perhaps you know of a child who is at risk, living in poverty, or some other unfortunate situation? Do you know of a family that has been separated for several years because someone is serving in the military? Or worse yet, has a family member who has returned home disabled by an injury sustained in combat while serving their country? Would it brighten their lives and lift their spirits to take the wheel of a large sail or power boat for an exciting, fun filled cruise on Lake Ontario or Seneca Lake on a beautiful summer day? Or perhaps they’d rather go on a fishing trip, to try to catch a really big fish? Our fully rigged fishing vessel leaves the dock complete with everything they will need from tackle to snacks and cold drinks; and our fishing charters come complete with expert fisherman to serve as your guides and mentors. 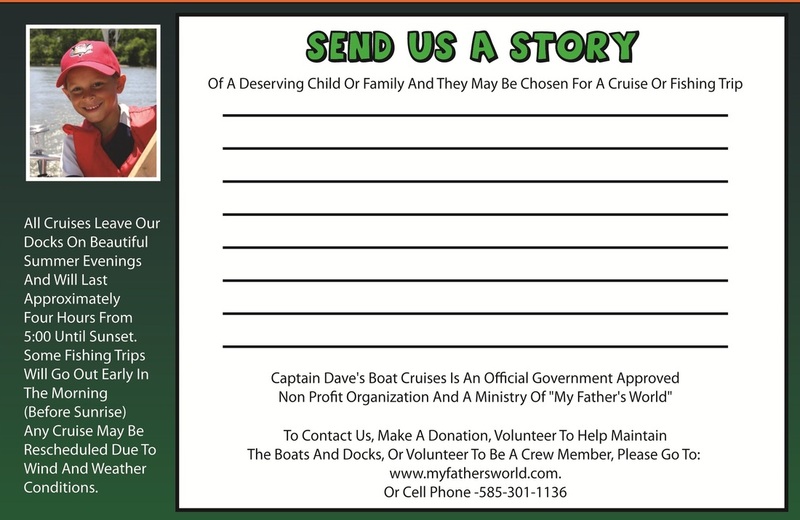 Captain Dave is looking for a few special kids and families, who deserve and would benefit from these great experiences. Please have them call us or send us their story so they can be scheduled for a cruise or a fishing trip with the Captain and his crew. Any child selected for a cruise must be accompanied by at least one responsible adult, parent, guardian or supervisor; But they are invited to bring their entire immediate family and / or a few close friends. We have recently expanded and we now offer boat cruises and fishing trips in Rochester NY, Geneva NY, Youngstown NY and Jacksonville FL! There is no cost to the child or their family for one of Captain Dave's boat trips. Donations are accepted from businesses and private sponsors for insurance, boat maintenance, fuel, docking & storage fees; and refurbishing of the vessels. Please send us a letter or email that tells about the deserving child or family, their situation, and their contact information (or call us). Be sure to describe any handicaps or disabilities in detail if they have special physical needs that need to be considered when boarding and on board the vessels. Also specify their interest in either a fishing trip, power boat cruise, sailing cruise, or a sailing lesson and remember to let us know which of our locations works best for them.